(Al Hartmann | The Salt Lake Tribune) Brian Jessop, head of Paragon Contractors and a Hildale city council member walks to Federal Court for trial in Salt Lake City Tuesday Feb. 27 2018. 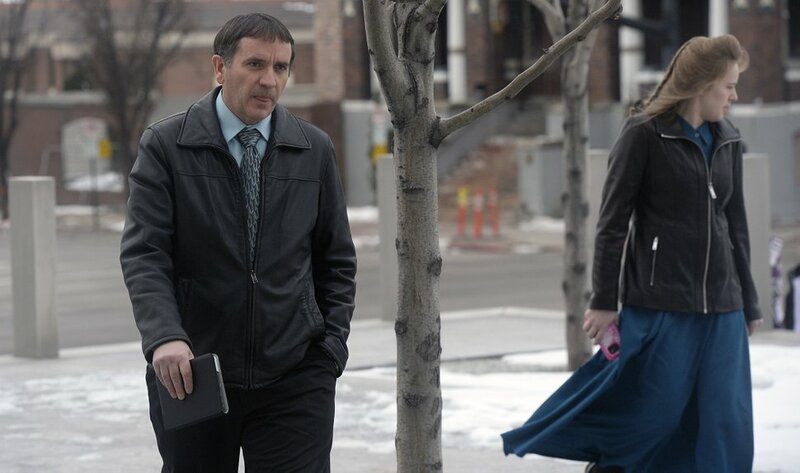 A federal appeals court has upheld most of the ruling against a company affiliated with a polygamous church and which was found to have used child labor, though the company did win one point. The contempt of court finding against Paragon Contractors Corp. and its owner, Brian Jessop, stands, and they still must pay $200,000 into a fund to compensate the children who harvested pecans on a ranch near Hurricane in 2012. But the 10th Circuit Court of Appeals said a federal judge in Salt Lake City was wrong to make Jessop and Paragon report to what is called a special master — someone who would monitor their business practices. That could be an important ruling for Jessop. Last month, he appeared at a new court hearing where he was accused of failing to comply with that special master. Jessop is a city councilman in Hildale. Both he and Paragon have ties to the polygamous Fundamentalist Church of Jesus Christ of Latter-Day Saints. In December 2012, children from the FLDS were sent to the pecan ranch. Some of those children later described that harvest and others they worked on at the ranch. They complained of being cold, having limited access to bathrooms and being required to work to keep themselves and their families in good standing with the FLDS. Most importantly, they testified they were not paid for their labor. Paragon and Jessop had entered into an agreement with the U.S. Department of Labor in 2007 to not use child labor in ways that violated the law. After hearing testimony about the 2012 pecan harvest, U.S. District Judge Tena Campbell found Paragon and Jessop in contempt for violating the earlier agreement. She then ordered the $200,000 be paid and that Paragon and Jessop report their work to the special master. In Tuesday’s ruling, the 10th Circuit Court in Denver rejected the argument that the children were volunteers or that they were the responsibility of an independent contractor. But the court said that by the time of Campbell’s ruling in 2016, Paragon and Jessop were in compliance with the earlier agreement. Therefore, the 10th Circuit Court ruled, appointing a special master who would ensure future compliance exceeded Campbell’s authority. “A coercive sanction cannot be imposed on a party that is currently in compliance just to ensure future compliance,” the 10th Circuit Court judges wrote. Jessop may still be in trouble for more recent business dealings. At the hearing last month, the Labor Department presented evidence that Paragon had folded into a new company, called Par 2, that should inherit the child labor restrictions imposed in 2007. Inspectors in Arizona found Par 2 building a motel. They also suspected Par 2 of employing two 17-year-olds who were using nail guns. Federal labor laws says no one under 18 may operate such machinery. Jeff Matura, an attorney for Par 2, on Thursday said a judge in Salt Lake City can still consider whether Par 2 is subject to the order not to violate child labor laws, but questions about the special master are moot. “We can’t be held in contempt for violating something that should not have been ordered in the first place,” Matura said.